Medicine the way we know is a new invention. Instead, for the millennia of our evolution, humans have learned to rely on natural remedies to cure common illnesses. About a week ago I woke up with a sore throat and generally feeling pretty crappy (I blame the Christmas party at my office). I lounged around, but the cold did not go away. Then the following day, my girlfriend and I went for a stroll in Fredericksburg, Virginia, a historical town located about an hour and half south of my home. There we stumbled upon PA Dutch, shop lined with drawer upon drawer of herbs, spices, and exotic tea. 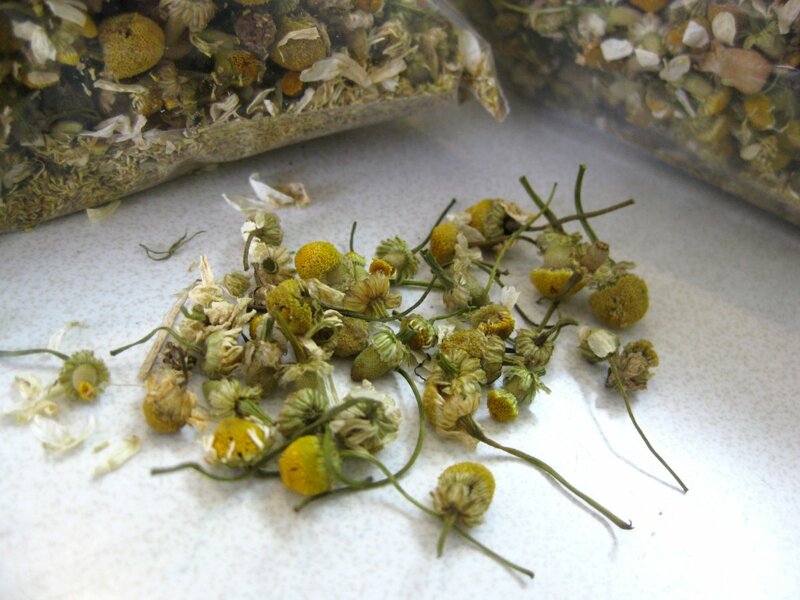 I picked up a 4oz bag of chamomile (harmanček), herb commonly used in Slovakia to treat the common cold. I remember as a child my grandma always telling me to go inhale the hot steam whenever I got sick. I really hated it. Yet, as you get older, you start to appreciate the wisdom of the elder generation. 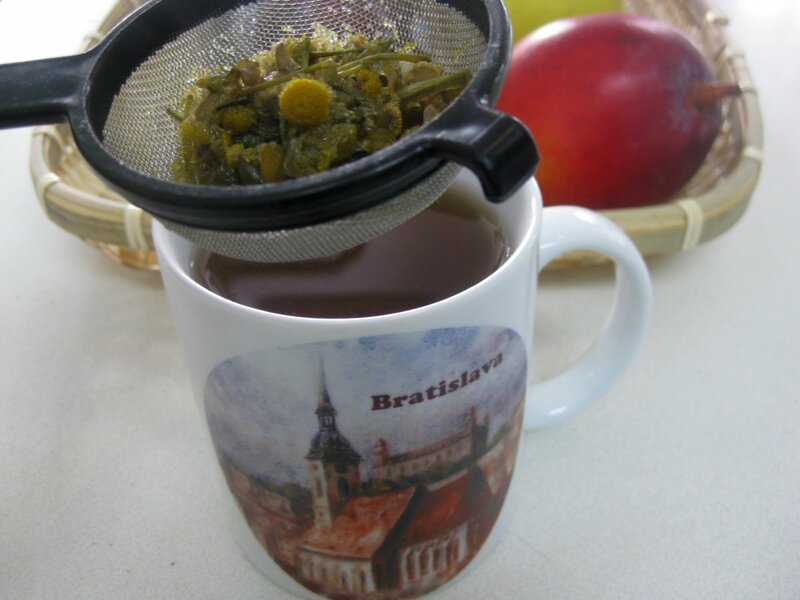 So when I got home, I made myself a chamomile steam (harmančekovú paru) and went “steaming” (naparovať). It really helped. Although my cold took few more days to go away, the pleasant, sweet-smelling steam really helped ease the symptoms. Each “session” was good for about half a day. Start by taking a handful of chamomile (harmanček) and place it in a pot of hot water. Bring the blend to near boil where steam starts forming on the surface. Either turn the heat off or turn it down all the way to low to keep the steam going. The water should not be boiling. 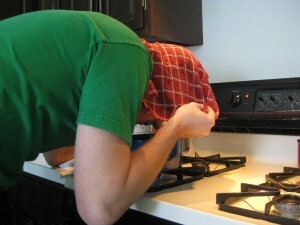 Place your head about 3 inches over the pot and put a towel or a cloth over your head. This towel will help keep the vapors in. Take a deep breath through your nose to get the essence all the way to your lungs. Do this for about 10 minutes also taking breaths here and there with your mouth. If you keep the flame on, be careful not to set the towel on fire! 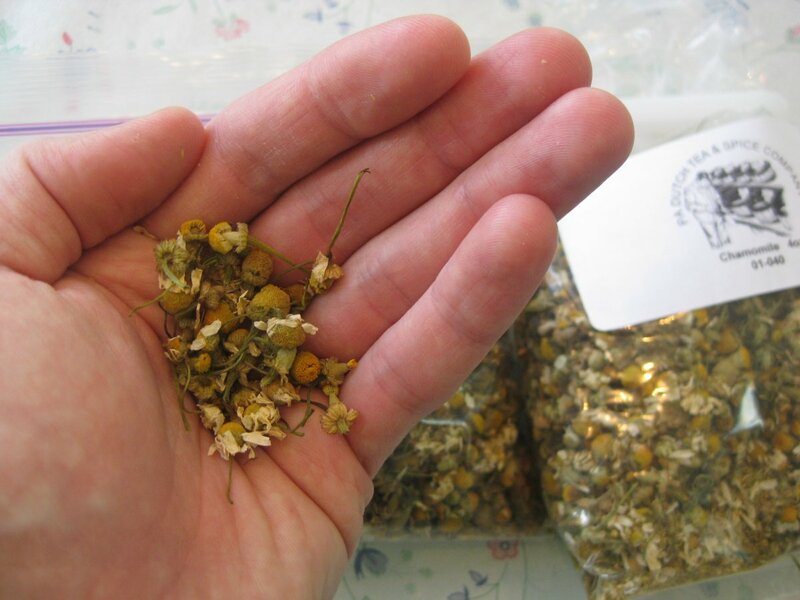 Chamomile is really just a weed. Its a small yellow and white flower that populates the roadside, open fields, and construction areas. It’s a native of Europe and temperate Asia, but by now it has spread all over the world. But despite being a weed, it’s truly a magical herb. It has antiseptic and anti-inflammatory properties, and is also a mild sedative. That’s why chamomile is the perfect tea (čaj) to drink before going to bed. You will also find a neat video about medicinal properties of chamomile, posted by folks from LearningHerbs.com. Now, chamomile is not for everyone. The flowers are full of pollen and folks with allergies to pollen or to ragweed (a close relative) should not use it. There is also some evidence that chamomile dries up the nasal cavities, so even though the wet steam initially provides relief, in the long term, chamomile can actually make the symptoms worse. So, another very popular alternative is sea salt (morská soľ). Sea salt is believed to help with respiration. I used to get sick quite often as a kid, getting bronchitis almost annually. I remember doctors recommending my mom to take me to the sea (more) every year. I did not object – a vacation by the sea side is always nice. Sea salt is used commonly even these days. Many spas around Slovakia (Slovakia has a lot of great spas!) contain a salt room, room lined with salt crystals. You sit in this room for about 30 minutes, breathing, realixing, and getting better. When it comes to soothing a cold with sea salt, you do the same as with chamomile, simply dissolve the salt in the steaming water, place your head over it, cover it with a towel, and inhale for 10 to 20 minutes. But the natural remedies don’t end there. There are many other natural ingredients with beneficial healing properties. Here is a list from Pluska.sk, popular Slovak news magazine. The text below is more-or-less directly translated from the original. Pine (borovica): The pine needles have strong anti-septic properties. The steam also helps with the release of phlegm, eases congestion, and reduces a headache. Thyme (tymian): This spice works to reduce a strong cough, and also sooths the nasal and oral cavities. It can be used for bronchitis, and also help with release of phlegm. Use about two handfuls of fresh thyme, or two tablespoons of the dried variety. Chamomile (harmanček): It is one of the most well known herbs used for inhalation. 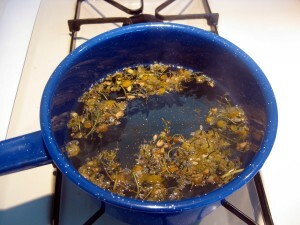 Use two tablespoons of dried flowers in hot water. It is most often used for inflammation of the upper respiratory tract. It can cause allergic reaction, and some experts also believe that it dries up the mucous membranes, which are then less resistant to bacterial infection. One sign of this is a stinging sensation in your nose, so you would be better off with an alternative if you get this reaction. Onion (cibuľa): No need for a pot or hot water. All you need is a cutting board and a knife. Simply chop up the onion finely, put your face over it, and cover yourself with a towel. The finer you chop the onion, the more of the healing chemicals will be released. It’s anti-septic and sooths a cough. (My comment – this sounds absolutely awful, and closer to torture than healing. But hey, perhaps it works). Sea salt (morská soľ): Salt is the universal aid in steaming, and is recommend by doctors the most often. Add two tablespoons of salt into boiling water, and let boil for few minutes. Inhalation of the vaports aids in treatment of chronic respiratory problems. Regular kitchen salt can be substituted, both have similar healing properties. Mint (mäta): Add a handful of dried mint into hot water, but to not boil. The vapor has disinfecting and anti-inflammatory properties. The pleasant aroma also reduces a headache. It shouldn’t be used by people allergic to plants from the aster family. Cinnamon (škorica): Boil one twig for three minutes in half a liter of water. The pleasant, Christmas-like aroma has antiviral and antibacterial properties. Thanks for all your helpful advise. I would also recommend something I’ve been doing for a cough at the stage where it seems like you cough from your chest and it hurts. I finely chop half onion, put about 2-3 teaspoons of sugar in it, mix it, let it sit covered over night in a mug or so and drink the juice that it produces in the morning. It’s not so awful since it’s sweet and it really helps me with the cough. Back to your comment:I wouldn’t like to breathe chopped up onion either! It must be hurting one’s eyes! i remember my grandmother used to make me gargle with hot water and baking soda whenever i had a soar throat. it was awful. the key to making pine tea is to make sure you dont knock it over when you are making it. Alex – haha, thanks for the reminder. I totally forgot about the tea incident. I also had to gargle when I was a kid, but with salt. I really hated that. I still do. I prefer steaming to salt gargle any day.